What is the relationship between music and the evangelistic program of the church today? The great mission of the church at this time is to evangelize and to finish the work of carrying the gospel to the ends of the earth. How is music to fit into this program? Or possibly the question should be more specific: What kind of music is evangelistic music? 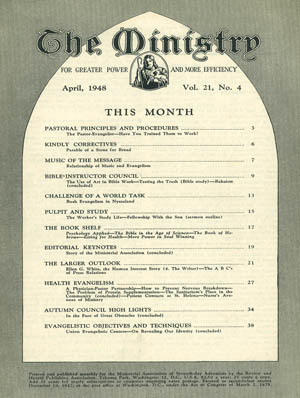 The term evangelistic music has a very defi­nite meaning to some, suggesting only the type of music known as the "gospel song," made popular in the Moody and Sankey revivals, and represented today by such gospel song publish­ers as the Hope Publishing Company, the Lil­linas Company, the Rodeheaver Hall-Mack Company, and others. There is no question but that this kind of music has had an enormous in­fluence for good, especially in the revivals and evangelistic campaigns of various churches. But the term evangelistic music should not be limited to one type of music. There is danger in thinking of evangelism as always following a definite and similar pattern—a series of meet­ings, a certain type of preaching, altar calls, the use of gospel songs, and possibly other features. This is all good, and is a part of one form of evangelism. But we would do well to enlarge our vision of evangelism to include more than such traditional approaches. We are witnessing today a new type of evan­gelism through the radio and correspondence lessons. Undoubtedly this is just as effective in reaching many. We are also proving the effi­cacy of visual aids as an evangelistic aid. And we must not forget the evangelistic influence of our schools, sanitariums, colporteurs, and others. In studying the entire field of evangelistic en­deavor, we need to recognize several important truths. One is that ,there are various types of people to be reached. People differ from one another in social and financial status, in educa­tional attainments, and in their hereditary and environmental backgrounds. Jesus recognized in His approach that not all were to be reached in the same way. In the work of the gospel it is a recognized principle that each individual must be reached in an individual way. Individual differences are recognized by successful gospel workers. Just so, there are also many varieties of sacred music to fit these differing personalities. The history of sacred music will show clearly that throughout the years the church Ivs used different kinds of music in the work of evange­lism. In the time of Luther the chorale was dominant in church music. Calvin used a dif­ferent kind, known as the psalm-tune. The evangelistic music in the time of Wesley has come down to us as some of our best hymns. In fact, a careful study of our own hymnal will reveal many so-called church hymns which are filled with the spirit of evangelism. Many such hymns make an evangelistic appeal to peo­ple who would not be reached by the gospel song alone. And the opposite is, of course, true. Too much distinction has been made between the "warm-blooded" and "Spirit-filled" gospel song and the "stately" and "uninspiring" church hymn. Although there is a difference be­tween the gospel song and the church hymn, it would be much better to make a distinction along other lines. Because these songs are products of human composition, there are good and bad hymns as well as gospel songs. We are not in­terested in this distinction just now. In time, the poorer examples of both fall into diklse, and the better ones survive. There is a large section of music which we rec­ognize as sacred. Of this sacred music there are various types or kinds which are effective in the work of evangelism. Some people are reached by a short chorus; others are touched by the singing of gospel songs, either as solos or by the congregation; others are appealed to by the message of some of the beautiful hymns of the church; and still others, with a different background, may find an appeal in the words and music of an aria or a chorus from one of the great oratorios. Let us not classify everything outside of the gospel-song field as nonevangelistic. Eternity alone will reveal how many souls have turned to God through the influence of the great reli­gious music of the centuries, through Bach, Handel, Mendelssohn, and others. It is true that such music seems to be used primarily on the concert platform, but it is not for us to judge how many souls have been reached through this type of music. Our sacrea music, whether used in church, college chapel, Sabbath school, the evangelistic meeting, or in the privacy of the home, may all have the ring of evangelism in it (the turning of sinners to God) if in humility we consecrate this great talent to His service.